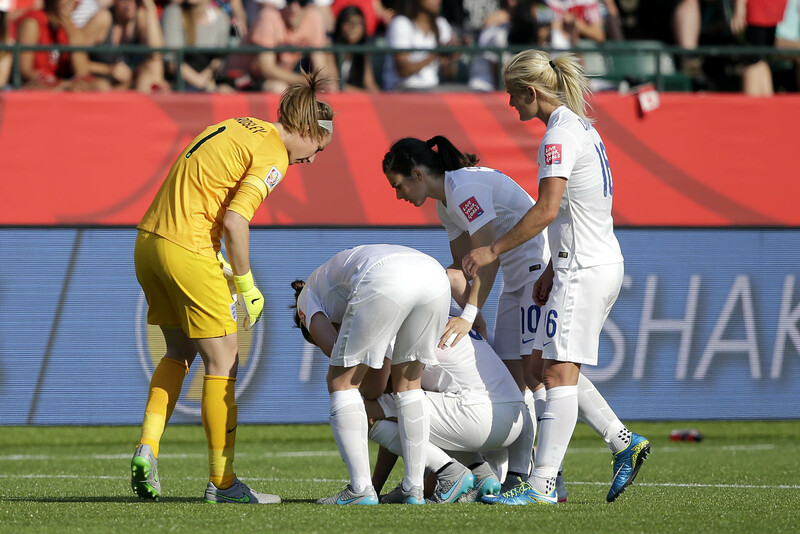 Laura Bassett flattened on the grass after her left foot got in the way of a ball and sent it into the opposing team’s net in the Women’s World Cup Semifinal, 2015. Brandi Chastain kneeling in her black sports bra, whipping her shirt over her head in a primal “yes,” Women’s World Cup Final 1999. These images of women athletes in the agony or ecstasy of competition claim their place as part of a community’s collective memory. Why do they matter? What do they mean? I can’t trot a block; I’ll never know what it feels like to be a world class female soccer player. But there’s something about these moments as viewers that bring us to our feet cheering, or drop us to earth in sympathy for the fallen. They make us feel like part of a larger whole. They transport us from our own daily reality into a realm that feels important and free of earthly limits. But can we trust what we feel in those moments? Are they about uplifting communion, or a loss of individual judgment and self-control? …There are emotions and ways of behaving that sweep through assembled groups and massed throngs of people and move them in special dramatic ways….Boundaries of self start to break down and emotions gain strength from physical closeness, and can then erupt into action of great intensity, thougt usually of short duration. Very possibly such experiences of coming together to resist immediate challenge, or to rush toward some passionately desired goal, cast back to prehuman and prelingual strategies employed in the face of danger of or the need for concerted attack. Religious ritual sometimes tries to create this deep bonding purposely. …they are on to something important when they describe the way — far more than in past ages — sports has risen up to fill a spiritual void. The communal whoosh-ups of sports have taken on unexpected significance for me in the last couple of years. My husband’s health problems have reduced both our income and our mobility, and that has narrowed my world in both adventure and community. We have taken refuge close to home. 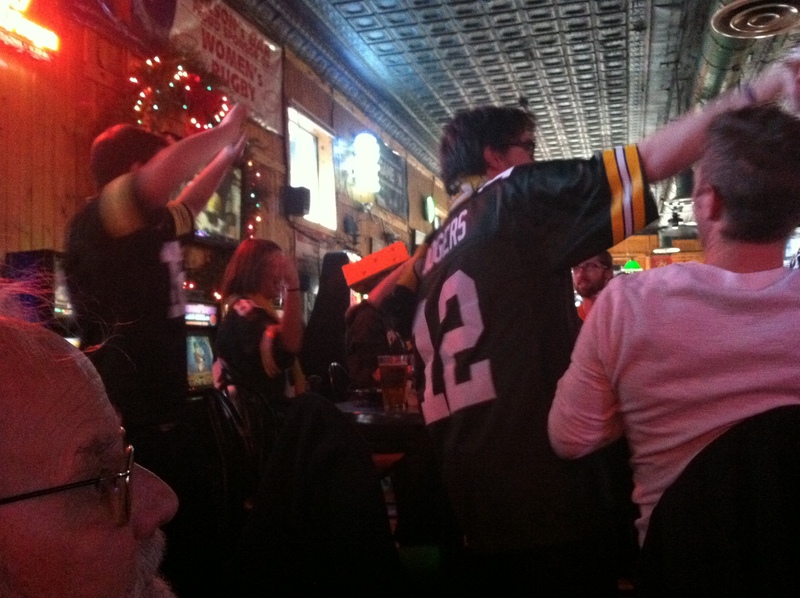 We began to participate in a ritual we would once have scoffed at—going to local bars during football season to root for the Green Bay Packers. Before this narrowing I couldn’t care less about the position of a ball in the middle of a greensward dotted with husky men in shiny colors, nor do I care now. But I am drawn by that “prehuman and prelingual state,” to use Janeway’s words, when “boundaries of self start to break down and emotions gain strength from physical closeness.” I was glad to find a name for it in Brooks’ column. Win or lose, people who have been whooshing-up at sporting events emerge into the streets to brawl and burn cars. When a home team suffers an upset loss, violence by men against their wives and girlfriends increases by 10 percent, a 2011 study of police reports of violent incidents during the professional football season found. I believe that sports are fundamentally inconsequential, unimportant, and certainly not a justifiable reason for aggression against people or possessions. It offends me that in the USA, we expend vast amounts to build stadiums, but let roads and schools wither. It bothers me that we celebrate ritualized violence on sporting fields and ignore its consequences off-field. But sometimes I need to lighten up and go with the whoosh-up. The Women’s World Cup feels like sports at its most uplifting, and least trivial. Hurray for Title IX, which ended gender discrimination in the funding of school athletics. Without it those girls would probably not be on the soccer field and in the hearts of men and women all over the world. You feel like a feminist when you watch those long lithe women play. Who didn’t love seeing Brandi whip off her shirt, rendering an entire stadium speechless because she did what any male player would do. Who didn’t love seeing Laura Bassett’s teammates console her after that last-minute kick went astray, or love the fans around the world who piled on with their support. This is compassion. This is women’s whoosh-up. This we can trust. The saying goes, “It’s not whether you win or lose, but how you play the game.” Let’s hold sports FANS to the same standard. It’s not whether you fill your spiritual void with viewing sports, but whether that ritual creates deep bonds, and who is hurt and who is helped as a consequence. This entry was posted in Sarah's memoir and tagged brandi chasten, green bay packers, sports, women's world cup. Bookmark the permalink.